There is no right time to start “living”. If you have begun to enjoy the process of Life – no matter what the circumstances – you have learnt the art of living and you are now living a full Life! It was my birthday sometime last week. Among all those who called to wish me, was a friend from college, one of the few people on the planet who has known me for longer than Vaani has. He wondered if I was 50 yet. And I said I have two more years to get there! What followed was a pretty interesting conversation that I am happy to share here. 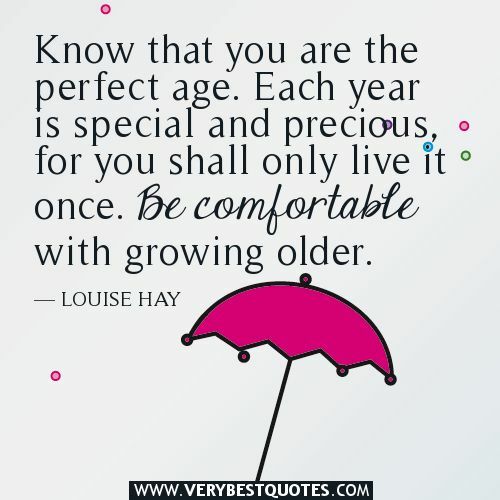 Him: What do you think of age – especially when you think of it on your birthday? Does it make you feel older, wiser? Me: Your birthday is an event which is truly something that you haven’t contributed to. And the process of biological aging too is both beyond your control and irreversible. So, I don’t think of these things. I only focus on how I am feeling. Most of the time, I am filled with excitement, curiosity and a sense of adventure over the uncertainty that surrounds my Life and career. There are times when I do feel some physical discomfort – a headache here, my rheumatoid arthritic condition there and such – but everyone has to deal with this at some time in their lives. Him: Do you get reflective on your birthday? Me: Birthdays are, yes, a good time to pause and reflect. I have often done that. And it helps evaluating yourself on the ‘living’ quotient. I feel that I was merely existing until I was 35 – earning a living, chasing name, fame, money! But through the most difficult period of my Life, in the past decade or more, I feel I have lived, and not merely existed! Given the bankruptcy that we are grappling with, as a Firm and as a family, Life is very, very tough. But there’s inner peace, there’s joy in living each moment and there is happiness and contentment with whatever is. Him: I know you to be a driven person. You have always set yourself very ambitious goals and you have also gone and got them. Has your ambitious nature dissolved with age? Me: Ambition, as I have come to understand, can manifest as avarice and as hunger. I used to be materialistically avaricious. Now I am spiritually hungry. So, I am still ambitious, but in a different sort of way! Me: Hey, listen, what is this that you are leading me on to…shooting so many questions at me? Him: Just curious…that’s why…to see what is the difference between growing older and growing up…? Me: Oh come on, I am not sure I have grown up yet. All I am sure about is that I have learnt to live fully, happily, despite the circumstances that pin me down! The essence of intelligent living is to understand the true nature of Life – of its beauty, its magic and its impermanence – and start living in the now. This alone can lead you to inner peace and happiness. Birthdays will come and go, seasons will come and go, success and failure will come and go, people will come and go, birth and death will keep on happening, and everything around you will change, but ultimately you, only you have to learn to live through and amidst all this change. This is the art of living. We fuss so much about growing old. Instead can we think about growing up? If there’s one thing that humankind uniformly obsesses over, it is age. Everyone wants to look younger. But few people want to be wiser. 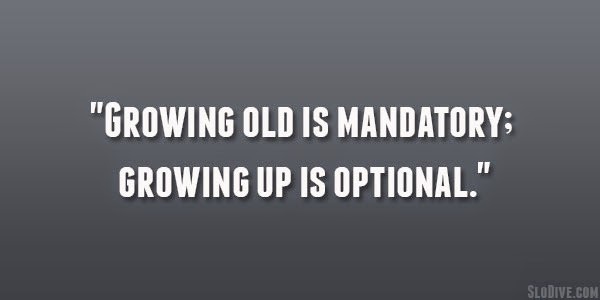 Growing old is mandatory though. If we lay in bed for a whole year, we would be older by a year more. But since growing up is optional, many people gloss over that choice! Hear what Osho, the Master, has to say about this. It is brilliant! “Our whole education is absolutely unaware of the fact that growing up is a different process than growing old. Even idiots grow old; only Buddhas grow up.” Growing up is not about knowledge and qualifications. It is about going within, connecting with your source, your core, your Self. When you delve deeper you will find value in the silence that will greet you there. And the peace that you discover inside you, in that silence, that peace makes you a Buddha. So, idiot or Buddha? Make your choice today! Author AVIS ViswanathanPosted on September 8, 2014 March 14, 2016 Categories Art of Living, Buddha, Growing Old, http://schemas.google.com/blogger/2008/kind#post, Inner Peace, Intelligent Living, OshoLeave a comment on Idiot or Buddha?